The East Asians continued to refine garden design with beautiful scholar gardens and landscape parks that incorporated the principles we now call Feng Shui. Chinese garden design ideas traveled north and were incorporated into the Korean and Japanese garden. This included the development of rock gardens and water features. Meanwhile, Europeans were living in a divided and uncertain world, with power collecting in the church. 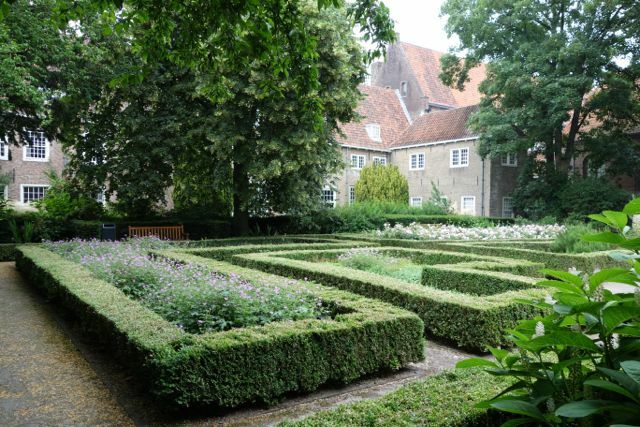 Gardens in Europe centered around the monastery based cloister garden. A beautiful space sheltered from the outside, divided into geometric plots and planted with useful plants for food and medicine, or to decorate the altar. By the end of the middle ages, we see the height of the Islamic garden. Luxurious plantings, fruit trees, and simple water elements featured in these elegant gardens. The influence of the Koran include the absence of human figures and water features laid out in quadrants that reference to the 4 rivers of Eden. Mathematics and geometry represented a pure and balanced world. Check out posts related to garden styles inspired by this period. Note that many will have been built in recent times.